I’ve heard many people complain about the sight or smell of Philadelphia’s homeless population. 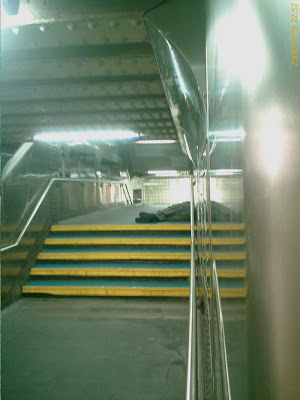 Homeless people, like the one in this photograph, often use the city’s public spaces as bedrooms and as shelter from the elements. I’m amazed when I hear those with homes complain about the homeless. Perhaps this is because I generally see no reason why our society hits a brick wall when it comes to accommodating our homeless. I am unable to comprehend how a nation that prides itself on “Democracy” with a big D … to the degree that its government and citizens feels compelled to dictate it upon the rest of the world’s nations … can foster the creation of sub human class systems. Instead of helping these possibly homeless, absolutely nomadic citizens, we turn our eyes, our noses, and our wallets from their dilemma. No matter the number of commentaries highlighting their struggles, so similar to all Americans … We still turn a cold shoulder to these people. We treat them as inhuman, but these people are just as human, and perhaps more human than the rest of us. They know what it is to suffer, to struggle to survive. They serve as a consistent reminder of what ills face so much of the world’s population. There are times when I want to do just what he is doing and simply lay down along the wall of a subway cross walk in Philadelphia … and then I pause. That would just be a selfish action.